Refrigeration is provided by an Isotherm ASU holding plate unit. Meats can be kept frozen in the area immediately surrounding the holding plate. The original insulation in the lids was inadequate, so I replaced it with 3 1/2 inches of urethane foam covered in epoxy/fiberglass. The original piano hinge at the rear was removed and replaced with spring-loaded pin hinges at each end, allowing total removal of the doors for cleaning and major stocking efforts. This is the view of the rear of the Farymann engine. Note that there is enough room in the engine room for me to hold a camera and get this picture. 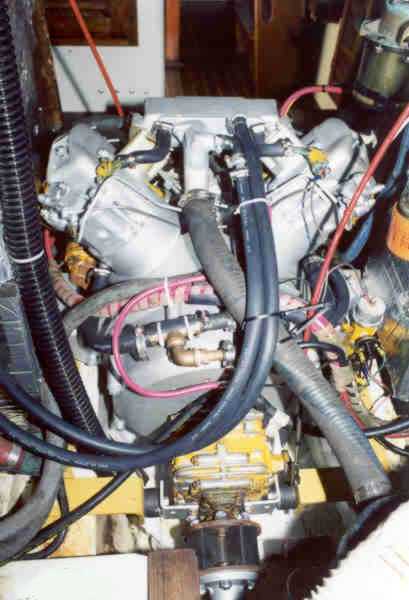 Some items of note: The oil filter has been mounted up to the starboard side next to the cooling water inlet strainer for easy access using an adapter and hydraulic hoses. The stock Farymann flexible shaft coupler is visible at the bottom of the picture. The standard Farymann cooling plumbing has been replaced with heater hose and bronze fittings for ease and economy of repair. Here’s a shot of the battery box with the lid secured. The box contains 4 6V golf cart batteries for a total capacity of approximately 450AH. Here’s a shot of the A/C unit with the cover removed. The unit is a Mermaid Marine 16,000 btu model with reverse cycle heat, and is adequate for the boat even when outside temps are in the 90’s. 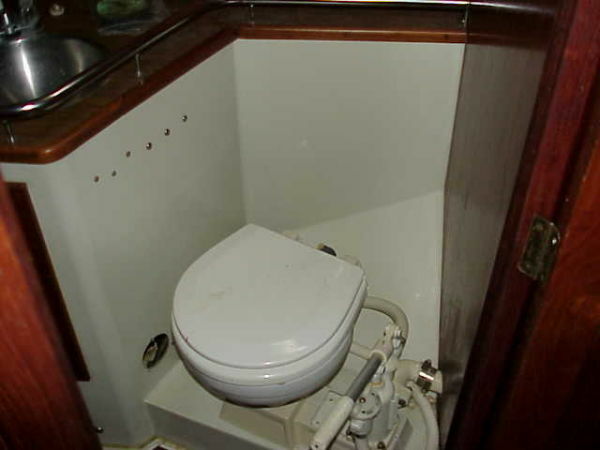 The discharge air splits into a 4 inch duct with an outlet at the nav station and a 6 inch duct with outlets in the V-berth and forward end of the main salon. We did install a layer of “Reflectix” insulation in the headliner which has helped reduce the heat load on sunny days. 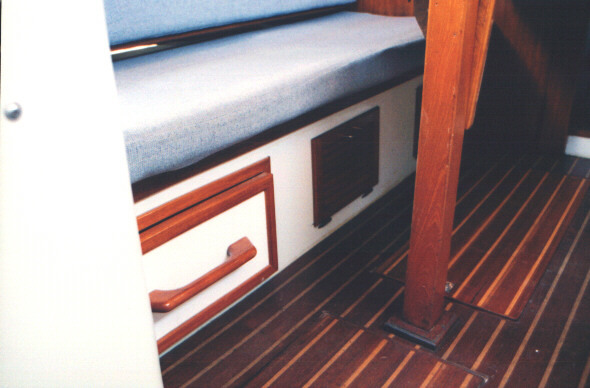 Air Conditioner – Cover In Place…..
After much soul searching, it was decided that the “foot space” under the nav table was the best location for the A/C unit, as that space tended to accumulate junk anyway and a duct could be run forward from there. There is about a 3 inch space between the unit and the nav table pedestal that allows ample return air flow and access to the electrical breakers and switches mounted thereon. 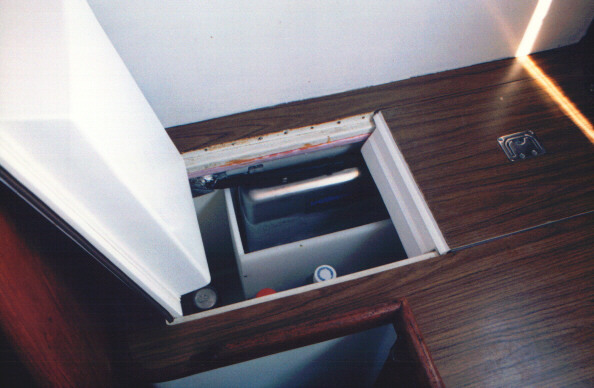 A hole in the pedestal also lets the A/C unit draw some air through the wet locker, helping things to dry out quickly. The thermostat is mounted directly in the return air flow, ensuring good control response. 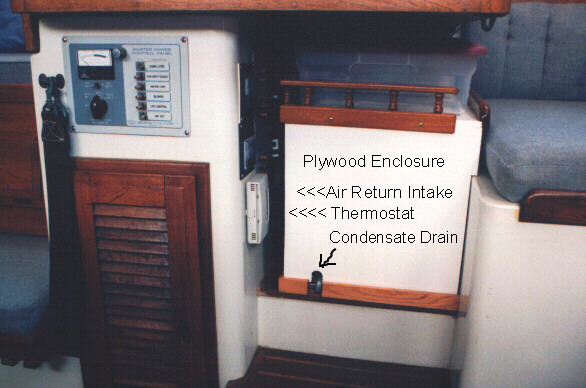 The condensate tray under the evaporator drains to the bilge. The galley is pretty much stock. 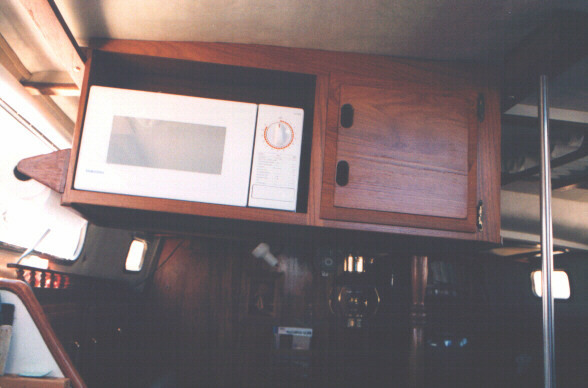 The original stove has been replaced with a force-10 unit and a cabinet installed over the sink for glassware and a microwave oven. Covers for the sink and trash well double as cutting boards. I swore I’d never have one of these on the boat, but now I’m wondering why I waited so long. The unit is a small (600W), cheap one that is readily avalable at the various X-Mart’s (you pick the prefix) in the U.S. 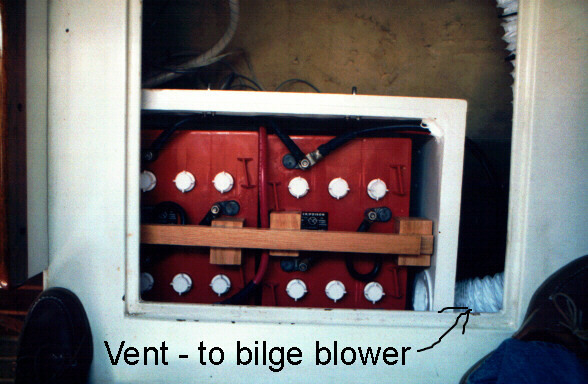 This is the biggest one that our 1000W Heart inverter will drive without complaining. 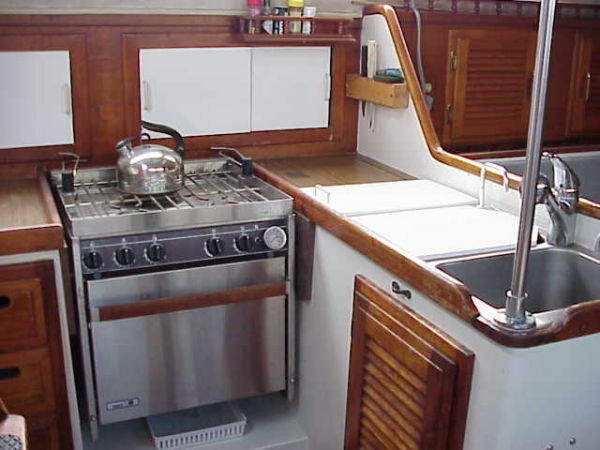 Cooking times are a little longer when running off the inverter due to the modified sine wave, but it is still great for heating things up without heating up the boat. I got tired of “dumpster diving” to get into the storage under the port setee. 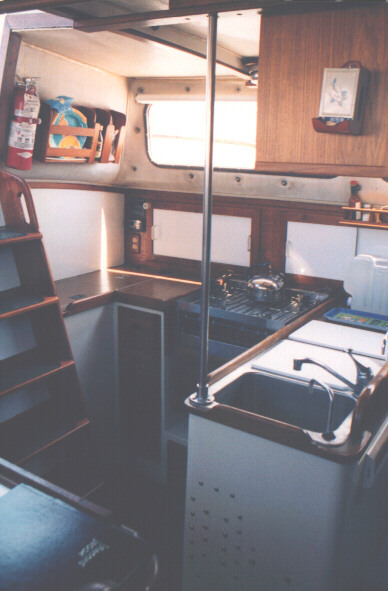 The large drawer will hold all of our galley pots & pans etc.. The two louvered doors allow access to the rest of the space. We have found some plastic baskets that just fit through the doors make organizing stuff much easier. 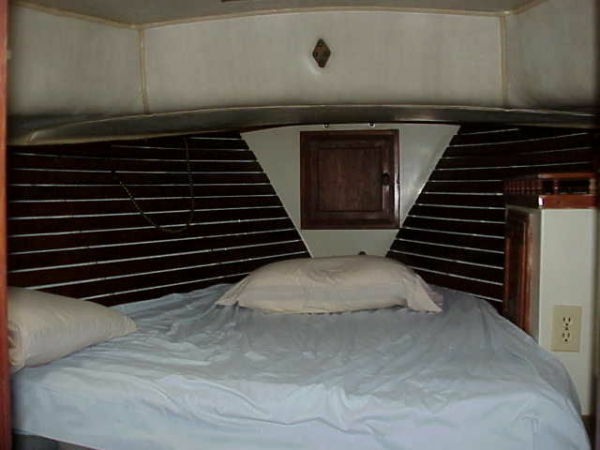 Main Salon – Starboard Side: Setee pulls out to make a single berth. Fixed pilot berth above is the best sea berth on the boat. The main A/C discharge vent is visible at the fwd. end of the settee back. 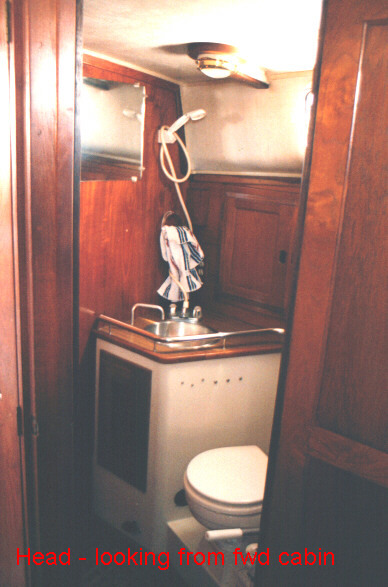 Main salon – port side: Lockers above setee are about 25% larger than originals and have proven much more useful. 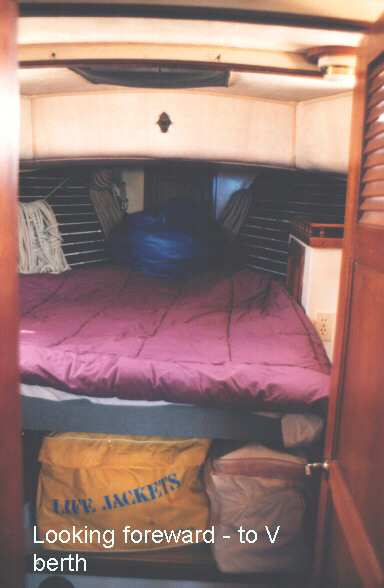 The setee makes up into a double berth and an overhead single. 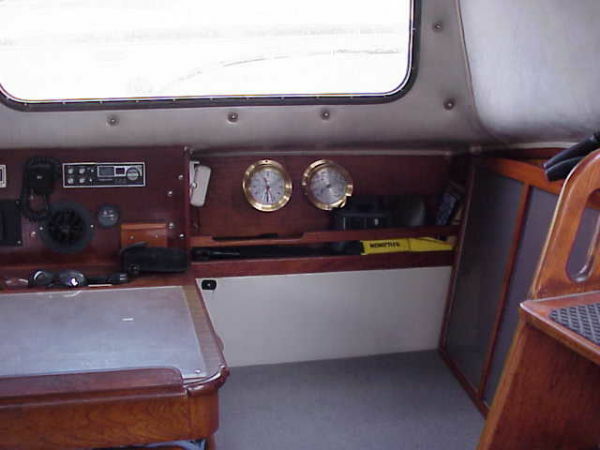 There is enough room behind the setee back to store a deflated dinghy and a couple of deck chairs. The kerosene trawler lamp is directly below an opening skylight, allowing the heat to escape on warm evenings. The drop leaf table is shown with the port leaf “up” – how we usually leave it. 2 can sit at the table without obstructing the passage forward. 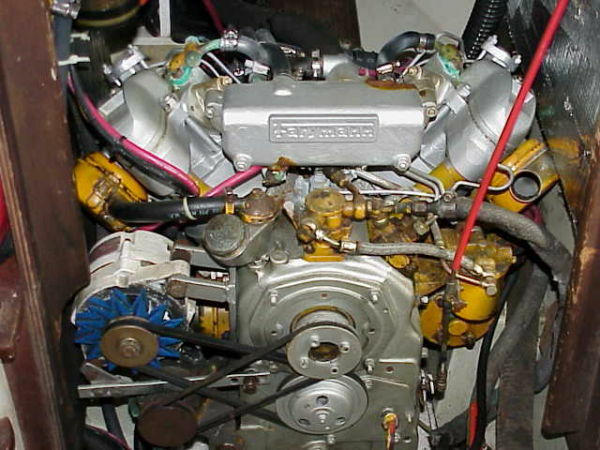 View of head from the fwd. cabin. 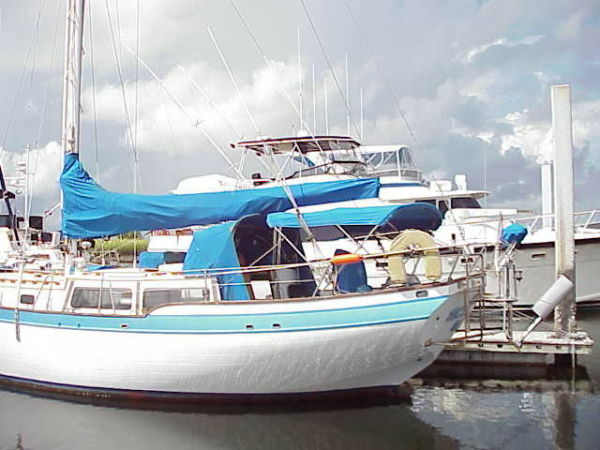 Original head has been replaced with a Raritan PH-II and a 35 gallon holding tank is installed under the forward V-berth. 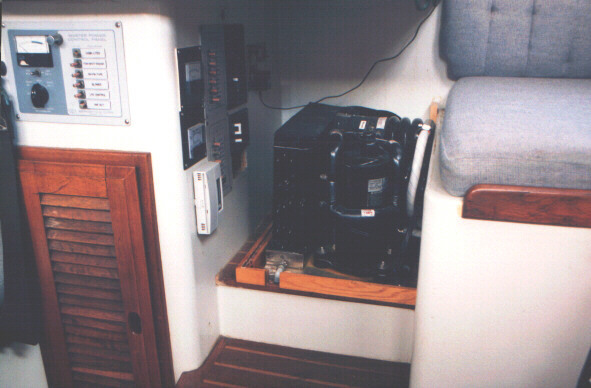 Tank can be pumped overboard with a manual pump, or emptied via a deck pump-out fitting. The shower sump pumps to the sink drain. 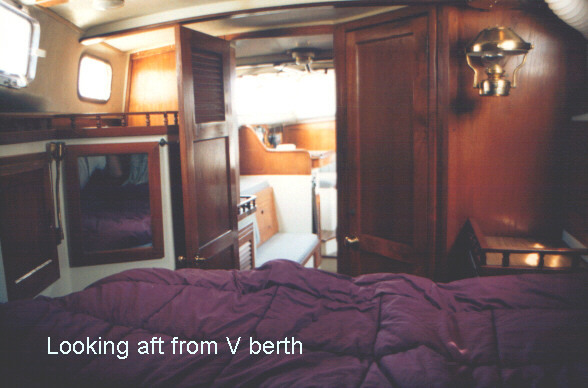 The V-Berth area can be closed off for privacy (if there is such a thing on a boat). 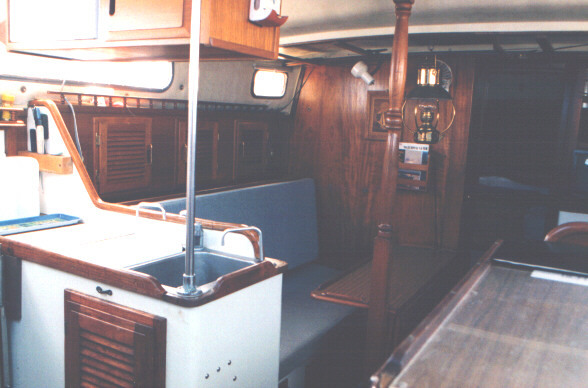 Fixed portlights on port and starboard side have been replaced with screened, opening units. 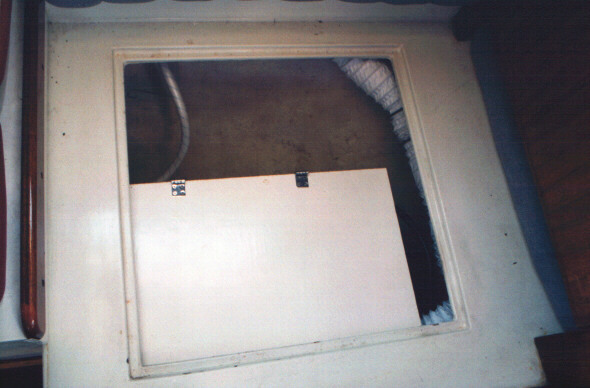 The forward hatch directly above also opens for ventilation. Hanging locker is to the left of the door. 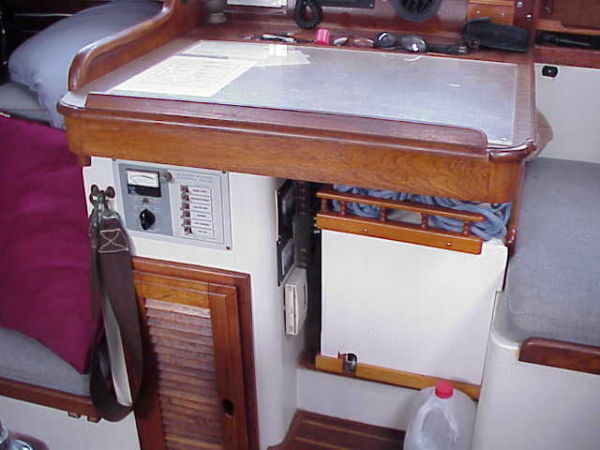 The portside locker (next to head) contains holding tank plumbing (vented loops, etc.) and is thus now relegated to storage of cleaning supplies and other yukkies. Any odors from the holding tank and its associated maze of plumbing are minimized with a solar powered vent that discharges to the exterior. 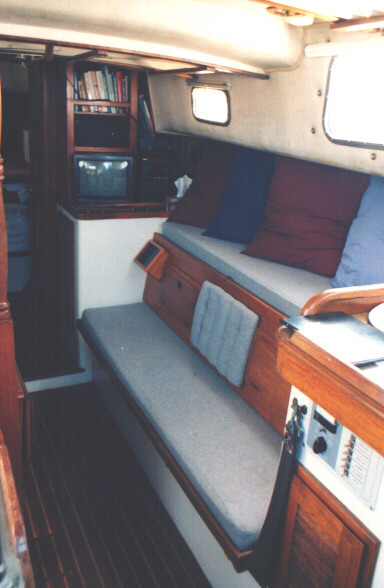 For coastal and ICW cruising, we leave the V-berth configured as a double. 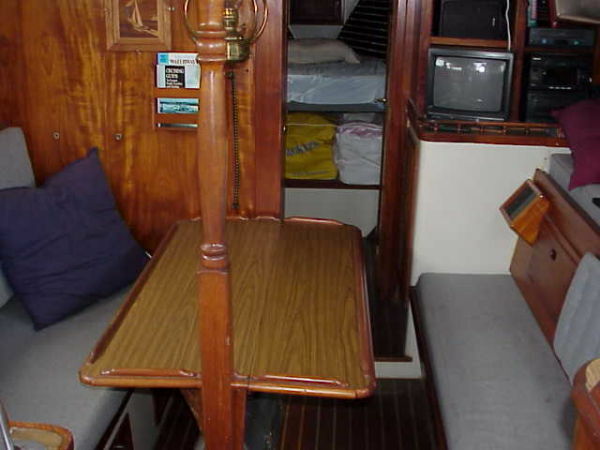 If you only need a single, the center cushion (just above the life jacket bag) drops down, making a nice seat for reading, leaving a single berth to port. Louvered door at forward end gives access to the chain locker. 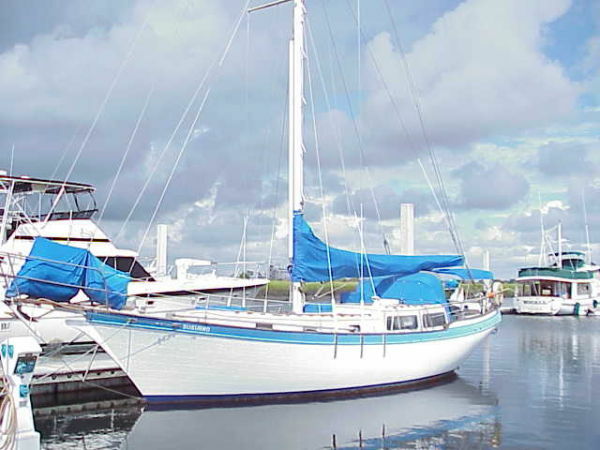 Forward is V-berth with lots of storage. 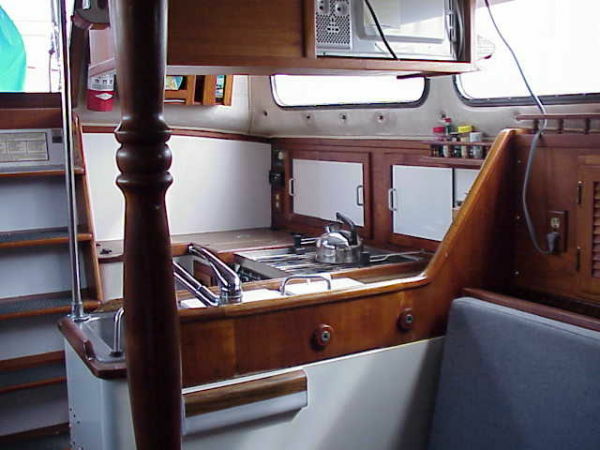 Next is enclosed head and shower, main salon with settees port and starboard, full dinette table, Nav Station and quarter berth to starboard, and full galley to port.